Bedridden patients in local and state-wide nursing homes have a greater quality of life when using Special Care Beds manufactured at Olds. The beds feature a moving base which helps to prevent bedsores in patients who are unable to move for long periods of time. Peter Olds said several of these beds were being used in local nursing homes and two weeks ago, an Innisfail nursing home added anther Olds Special Care Bed to its list of acquisitions. Olds also manufacture tilting beds. Peter said these beds came about following a comment made by an orderly at the Maryborough Hospital. The orderly said getting patients to their feet after a hip replacement or spinal injury was a problem. "Further injuries can occur when transferring patients from their beds to a tilting table," he said. "If you could make the bed tilt up, that would solve the problem." Peter then went about the task of designing a bed that could do just that. The invention has proven to be successful and when Pope John Paul needed rehabilitation for a broken hip, a bed was sent to aid his recovery. 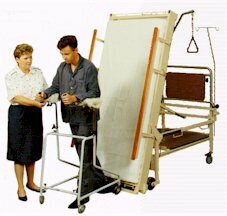 Special Care Beds are usually made to order. Interested people can see a prototype on display at Wm Olds & Sons Pty Ltd in North Street, Maryborough. In the area of health care, Olds also cater for wheelchair repairs for private individuals and the Health Department.